Match Day 16 of the GFA Division One produced 22 goals with leaders Victoria Hotspurs and nearest rivals Nadur Youngsters again underlined their prowess with resounding victories over lower-placed opposition. On the other hand, the relegation battle is getting tighter and tighter with five teams separated by just three points. The Hotspurs scored four goals in each half to crush Munxar Falcons 8-0 to tighten their grip on top spot. The Rabat side took the lead after 11 minutes with a fine header from Ferdinando Apap before they added two more goals through Emiliano Lattes (16) and Elton Da Silva (18). Two minutes before the break, Shaun Bajada tapped the ball home from close in as the Hotspurs went into the break 4-0 up. Da Silva completed his hat-trick with two quick-fire goals on 55 and 58 minutes. The goals kept flowing as the Hotspurs added a seventh goal four minute later through a Henrique Maciel header before Da Silva sealed the win on 69 minutes from the penalty spot. Nadur Youngsters kept in touch with the Division One leaders when they brushed aside Għajnsielem 5-0. The Blacks looked in the game but their hopes of taking full points were compromised by their erratic finishing. The Youngsters took control in the first half when netting three goals without reply. Lucas Barreto Da Silva put them ahead after three minutes before Leiner Garcia Panesso made it 2-0 four minutes later. Nadur added a third two minutes before the break with a low shot from Marcelo Barbosa. The Brazilian struck again on 68 minutes when he fired the ball home from a short clearance. Panesso wrapped up the win with a fifth goal on 70 minutes. Relegation strugglers Kerċem Ajax came from behind to beat Xewkija Tigers 3-2. This was Kerċem’s second win in the championship over Xewkija who conceded their third successive loss. Xewkija were all over their opponents in the first half but could only manage a one-goal lead through a Halleson Tiago Barbosa Honorat goal from a penalty. The Ajax hit back after the break and levelled matters on 67 minutes through an Andrea Debrincat shot. Kerċem completed the comeback when Thomas Vella scored two quick-fire goals on 70 and 81 minutes. Xewkija tried to come back into the match but they could only pull one goal back through a long-range strike from Mark Dingli from a free-kick. SK Victoria Wanderers and Għarb Rangers shared four goals in a thrilling encounter. Għarb took the lead on 65 minutes through Hugo Santa Rosa Cruz. But the Wanderers levelled the score seven minutes later through Audgustine James Obaje. Għarb regained the lead on 84 minutes through a header by Manuel Gauci. But the Wanderers had the final say as they saved a point through a header by Moussa Bamba in stoppage time. In the GFA Division Two, promotion challengers Sannat Lions suffered a surprising defeat to Żebbuġ Rovers 2-1. The Lions looked complacent in the first half and the Rovers took full advantage when they surged two goals ahead through Lucas Farrugia (31) and Marcos Peres Vega (43). Sannat tried to re-open the match but were too erratic in front of goal. Żebbuġ finished the match with ten men when Clive Farrugia was dismissed for a second bookable offence on 87 minutes. Sannat only managed to score on the stroke of regular time through Joseph Zammit when there was no much time left to complete the comeback. Xagħra United took full advantage of Sannat’s slip-up when they edged past Oratory Youths 2-1. The win lifted Xagħra three points clear of Sannat, albeit the latter have a game in hand. 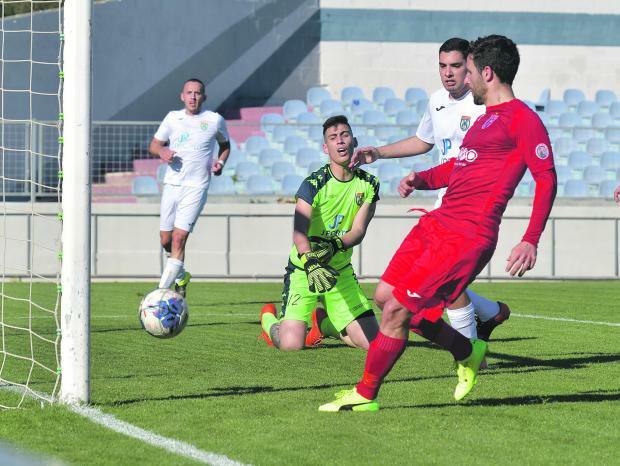 Xagħra opened the score on 44 minutes through Joseph George Vella but Oratory levelled the score on 65 minutes through Luis Claudio Carvalho Da Silva. Xagħra clinched the winner on 76 minutes through Matthias Michael Uzor. Xewkija Tigers and Nadur Youngsters will contest the final of the Division One Knock Out competition after hard-earned wins over Għajnsielem and SK Victoria Wanderers respectively. The match between Għajnsielem and Xewkija Tigers was decided after a penalty shoot-out after the match finished in a 2-2 draw. Dario Krstic put Xewkija ahed after 18 minutes but Għajnsielem equalised three minutes later through Luis Andre De Melo Lima. Christian Bugeja restored Xewkija’s lead on the stroke of half-time. After the break, the Blacks tries to save the match and they equalised on 79 minutes they equalised through Kenneth Mercieca. The score remained unchanged at the end of extra-time and a shoot-out was needed to declare a winner. Here, Xewkija scored four times through Michael Camilleri, Darko Krstic, Sergio Arturo Martinez Villa and Daniel Bogdanovic while Claudio Antunes had his shot from the spot kick saved by goalie Luke Buttigieg. Għajnsielem netted just three times through Kenneth Mercieca, Luis Andre De Melo Lima, and Damon Hili, as Dylan Mercieca and Alberto Xuereb had their shots saved by Xewkija’s keeper. Nadur Youngsters beat Gozitan champions SK Victoria Wanderers 4-2 after extra-time. The Citizens opened the sore on 19 minutes through Aud-gustine James Obaje but Nadur levelled the score through Shaun Attard on 57 minutes. Nadur continued to find it difficult to take command of the result and on 72 minutes the Wanderers regained the lead from a penalty converted by Predrag Dordevic. On 83 minutes Nadur had Josef Buttigieg sent off for a second bookable offence but Shaun Attard saved the result for Nadur four minutes later and forced the match into extra time. Nadur dictated matter during extra time and despite being with a player less they managed win the match folloiwng a brace from Marcelo Barbosa (104, 119). The Wanderers were also reduced to ten players on 120 minutes as Nicholas Vella was sent off for dissent.